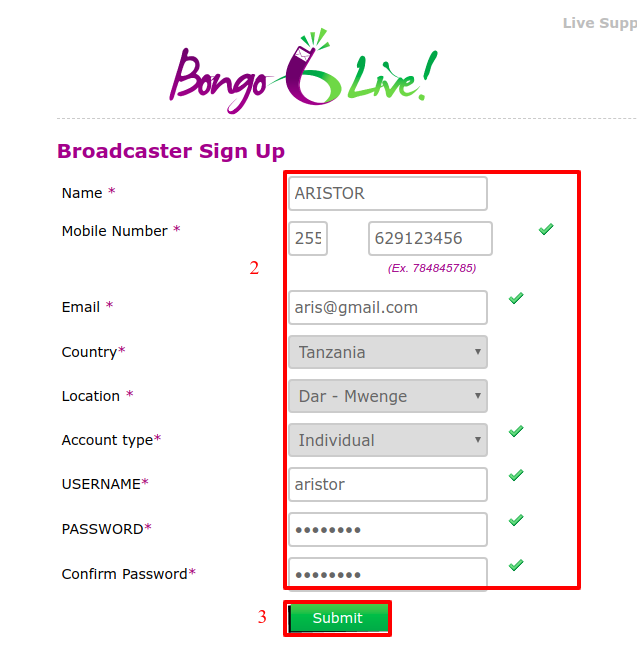 Visit our website https://www.bongolive.co.tz . To sign up as a broadcaster Click "Sign Up button" on the top right, and wait for the page to refresh. Fill in your details in the given boxes. Name - Your First & Last Name. Mobile Number - Always include country code without the leading +. Account Type - Select Organization if setting up an account for a company etc. Username- Should be 6 characters and above. Password-Should be 6 characters and above. Click "Submit button" when done. You will get a notification saying "Registered Successfully". You can now proceed to logging into your account.